Built as a boot that maximizes the ideals of agility, the next generation adidas Nemeziz 18+ is all about upgraded performance. Since their initial introduction to the market, adidas has looked to improve the fit and comfort of the silo, with this version taking on some dramatic new modifications. Visually, they are almost dizzying, but that plays into the overall package, offering players something they just don’t expect to experience. 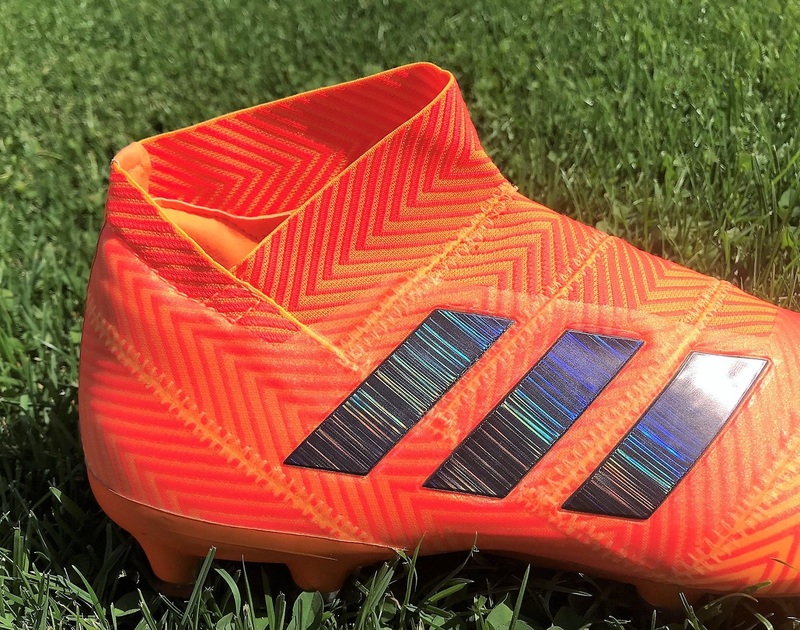 The laceless design has quickly gathered a cult following, with players enamored by the opportunity to wear a boot that leverages fit and compression to stay on foot. We’ve had this pair in testing for several weeks, and during that time we have found out some pretty interesting things about the silo that we just weren’t expecting. Find all the latest release Nemeziz colorways at soccer.com. First off, this wasn’t a boot released with the glitz and glamour we normally see from adidas. There was some coverage, but for the most part they just rolled out of bed and straight into World Cup action. Maybe a case of letting the boots do the talking? Either way, they are a very dynamic style boot with a lot of interesting pieces. 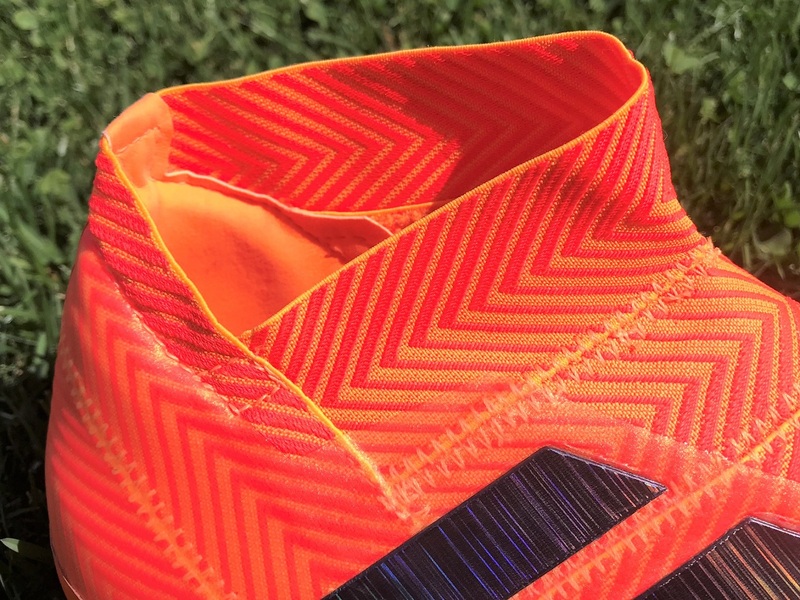 Laceless proved extremely effective on the original Nemeziz. Expectations are high that there is even better performance on offer here, where adidas has had the opportunity to assess and modify. Looking at the unusual cut of the collar gives you some indications that they found areas to improve on. Out of the box, this is not a boot you are going to want to take into a game. You could if you wanted to, I guess. But that is not how you are going to get the best out of them. Whether it is wearing them around the house or in short periods during practices, you need to ease your way into them. The upper is a little rigid – not stiff – starting out. So, you need to give the materials an opportunity to loosen up and feel more natural to your foot shape. Let me point out that this has less to do with discomfort or pressure points, and more related to creating a proper relationship with your pair. I personally took them through several training sessions before breaking them into a game. Even during the process of taking pics of them on foot, they didn’t feel right. I needed to loosen the upper up before they felt in-tune and ready for me to get the most out of. Once broken in, they are a very nice boot on foot. It might take some players a few wears to really connect with the overall fit. If you have never worn laceless boots, they need to be extra snug in order to stay on foot. So, there is a different sensation associated with wearing a pair. It isn’t uncomfortable, just…..different. Here lies one of the most different aspects of this release. adidas use a wild new asymmetrical mid-cut collar that is intended to offer a snug and locked down fit around the ankle. Looking at the lateral side of the boot, the collar is cut in a V-shape, where your outer ankle socket sort of sits in the missing pocket. So, it is different from the standard style collar you might be used to on elite level boots. On foot, I found that this provides a little extra security around the inside of your ankle, while providing freedom and a little extra torque around the outer side. It is an unusual sensation having pressure on one side but not on the other. There is not a boot collar on the market right now that will protect you from rolling your ankle. But for some players, and this comes through feedback, the compression provided from a collar offers more confidence and security in play. These don”t provide that same type of fit, if you are to roll your ankle to the outside, it feels like a standard collar-less boot. So, I’d rate this as a boot that provides a secure locked-in fit, with a more natural sensation and movement in play. 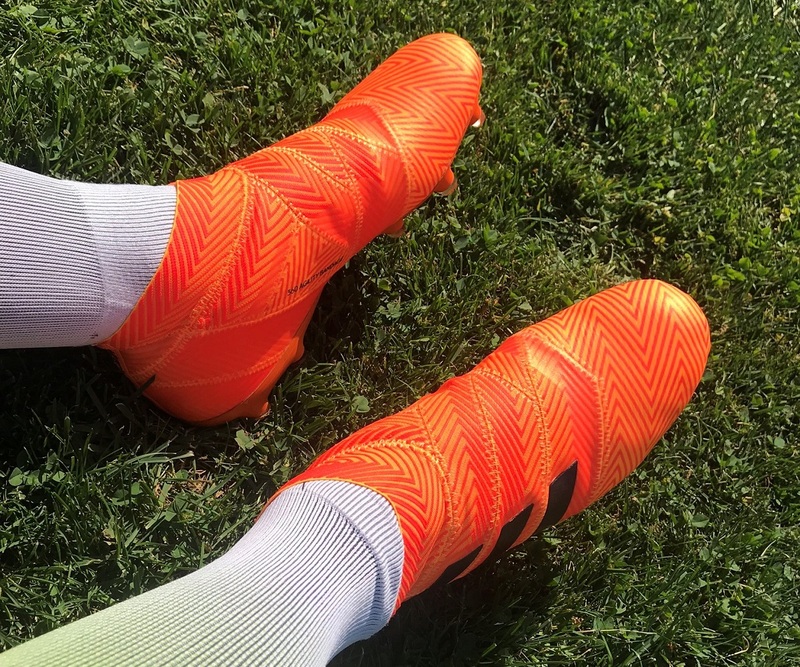 Compression is the all important word that has always been associates with the Nemeziz silo. It is the combination of Agilitybandage and Torsiontapes through the midfoot that allows the laceless style design to work. 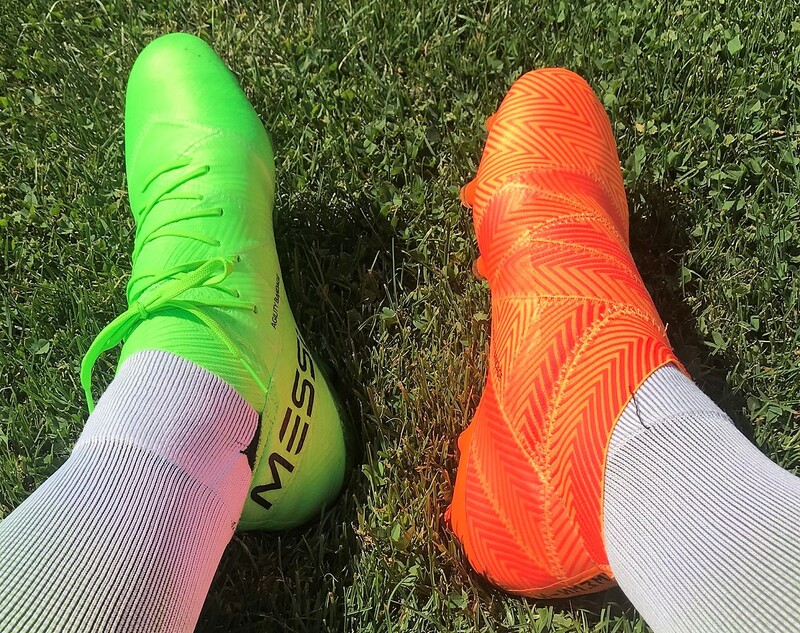 You get enough compression to keep them on foot without impacting the barefoot-like touch on the ball. Through wear, I can confirm that this is definitely not a boot that will fall off your foot. adidas has done a lot of research establishing the right balance between fit and comfort. 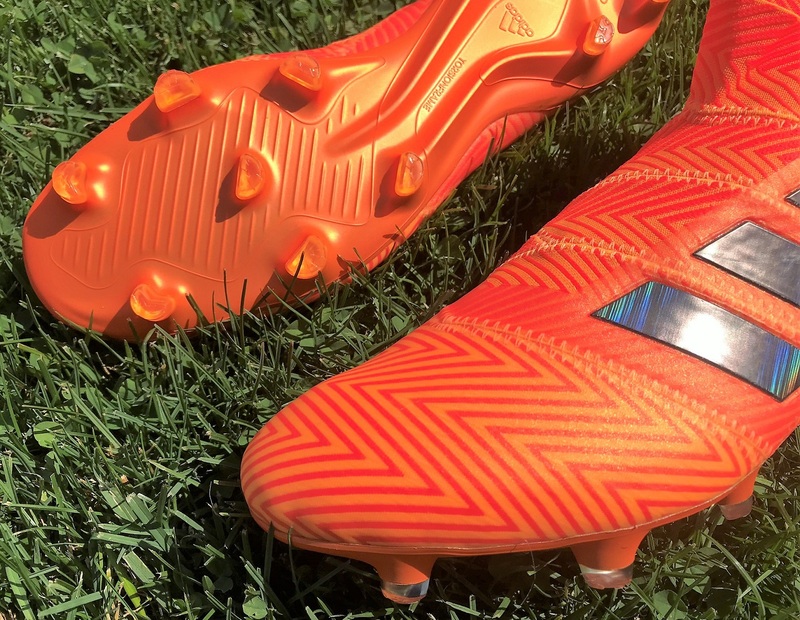 The toughest challenge is actually getting them on, but once you do that, it is just about learning to play with a boot that really offers an as-one feel. 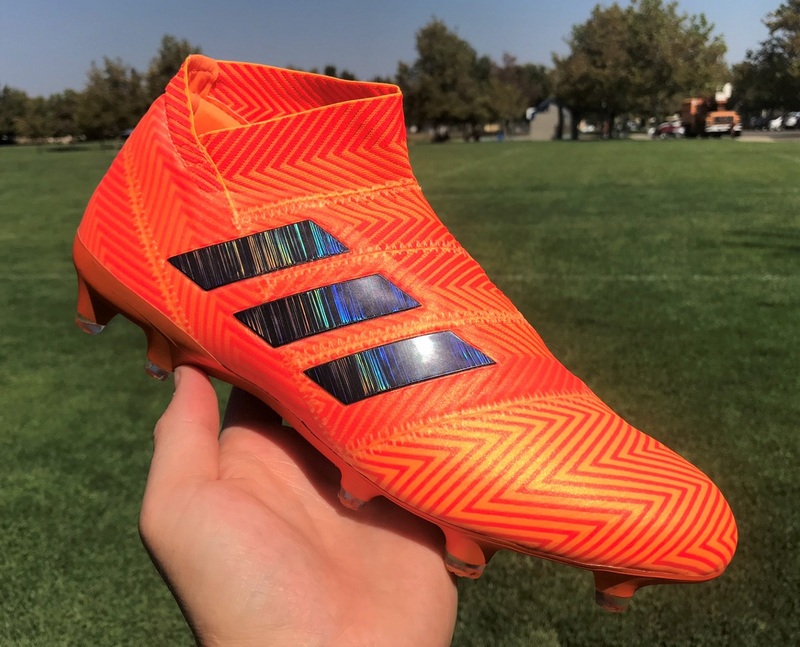 From the outside, the Nemeziz series is not intended to be a pure strikers boot. They don’t have any added power element and the inclusion of “bandages” through the upper doesn’t seem to instill confidence while striking shots. But you have to look at them from another angle. 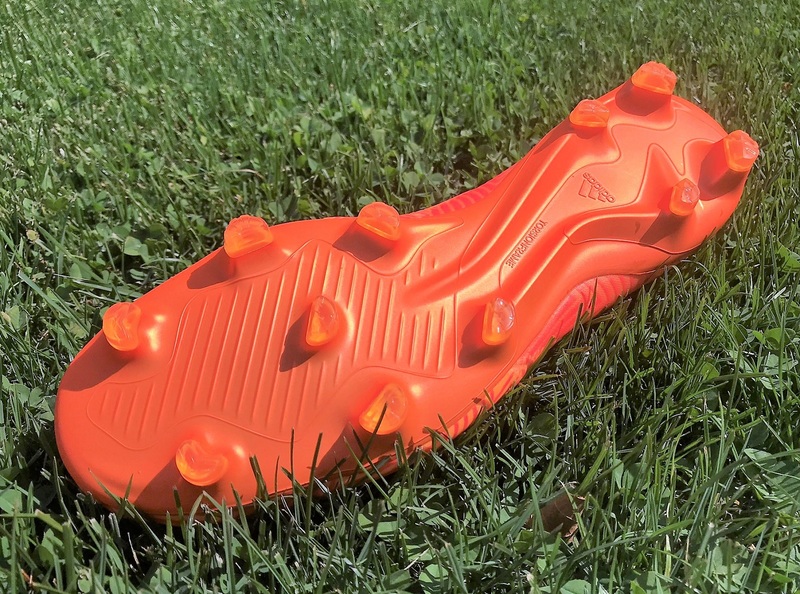 Instead of being a boot built for a pure striker, they are instead designed for the type of goalscorer that takes a different approach to scoring goals. We are talking about nifty, agile players that like to create as much as scoring goals. And when they do score, they are in or around the goal, using stealth to create opportunities. Think of the player that like to place shots and put curl on their shots rather than power. I would define them as ball manipulators. Ok, so what can you take away from that? These are not an ideal boot for driving shots. There is a layer of padding through the upper, but not like a traditional power boot would have. There is no real element to enhance touch, instead you have Agilityweave with a slightly tacky layer of synthetic across the forefoot to help when you get on the ball. Overall, they are pretty smooth to the touch. Pending you read above and now know who these are defined for, everything comes together and plays out beautifully well. We are talking about the Messi’s (even though he has his own version), Salah, Dybala, Jesus, Lucas, even Ander Herrera. You can see where this is going. If quick, intricate touches and quick passes are part of your game, then the performance of the Nemeziz 18 series is right down your street. Choosing laced or laceless is then down to personal preference. But you get a secured fit with clean touch and lot of natural feel on the ball. Underfoot, adidas use a Torsionframe outsole that is intended to keep you light on your feet and provide quick release out of the ground. 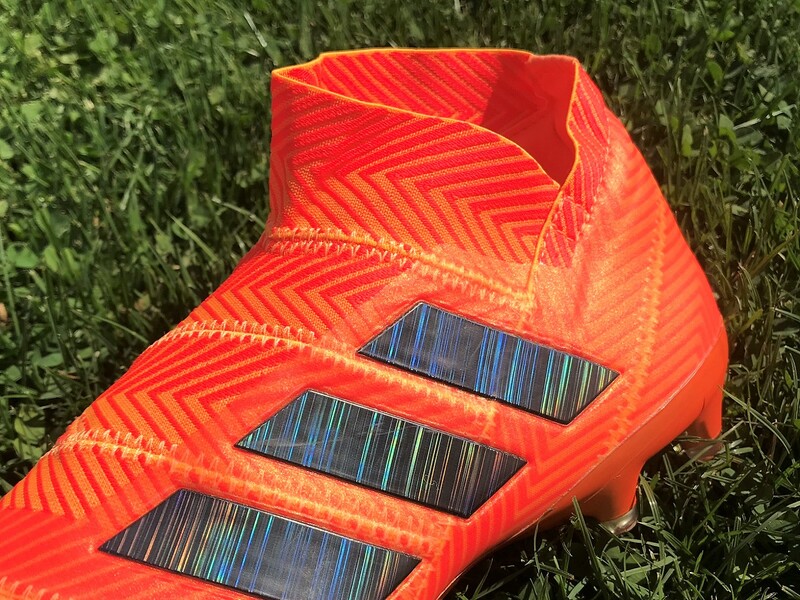 It is the same plate found on the Nemeziz 17 series, so adidas has obviously found something they feel is effective. Through the forefoot portion, Torsionribs are added to offer dynamic push-off support through acceleration and cutting. In reality, I found that the plate is very similar to the SprintFrame found on the Purechaos series. You get a lot of grip, with specifically angled studs providing confident traction through quick, sharp turns. Since these are marketed toward agile, speedy players it is a very good overall match. The overall takeaway here is that traction is on par with expectations, and there is nothing negative to report about how they perform on FG or artificial turf pitches. First note, they are slightly trickier to get on that other laceless boots. The collar itself is designed to be narrow, in order to create a snug fit. But the actual cut, means you don’t have enough material on both sides to grab and pull on. So, you end up wiggling your foot in more than pulling them on. Once you do get them on, they feel really nice on foot. The inner lining is super soft with a cushioned feel across the top of your foot. But that also reduces the amount of space you have inside. They are very much like a medium-wide fitting boot. I definitely wouldn’t say they have a wide fit, and that has a lot to do with the style around the forefoot. Through the midfoot you have Agilitybandages that provide some stretch, but the forefoot has a thin synthetic layer over it that keeps the boots shape in place. Thus, there isn’t much change over time and it won’t suit a wider fitting player. If you are looking for a narrow fit, they are a suitable option. Again, the bonus of knit uppers (especially a laceless one) is that they need to rely on compression to keep you locked in. So, they naturally provide a snug fit suitable for narrow fitting players right out of the box. Final note, as funny as it might sound, if you have back problems you are probably not going to want a pair of these. The process of pulling them off definitely presented some challenges, and I dare say some players might pull a muscle doing so when their bodies are tired post game. Lol. 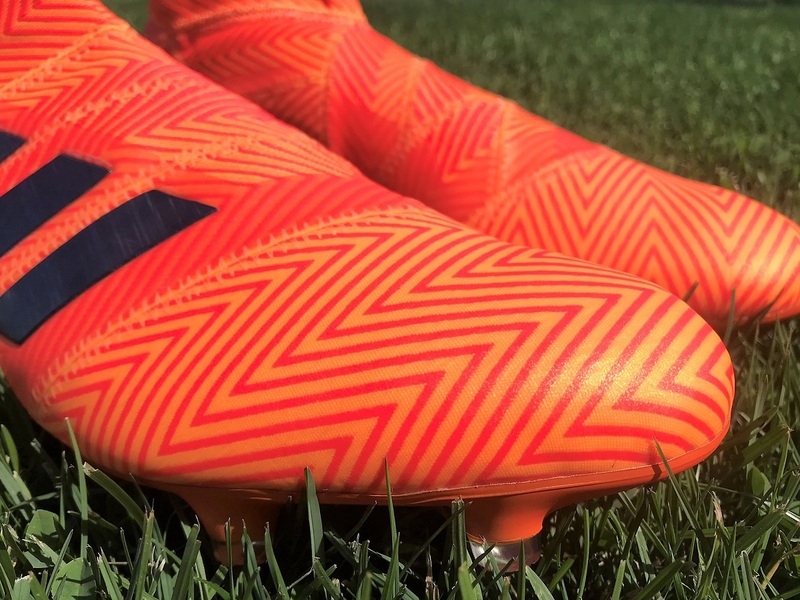 There are two key differences between the 18+ and the Nemeziz 18.1. First, and most importantly is the lacing system. Obviously there are none on the 18+ and you are relying on compression to keep them on foot. The 18.1 offers a similar compression fit and feel on foot, but you have the added bonus of being able to lace them to your own specifications, creating a more personalized fit. As a result of this, the mid cut collar is not as necessary, so adidas has trimmed it down and created groves around both ankle sockets. This provides a much different feel around the ankle. If you prefer a little extra freedom in your boots, the 18.1 is a better option. But if you want the total tech advanced package, the 18+ is the want to go. To date, thy have held up really well with no durability issues to report. If anything changes, I will update this section! adidas are getting very close to perfecting laceless boots, and this is another fine example of how far they have advanced the style. It is as solid as we have seen to date. But, you need to understand that laceless means a lot of compression, and that you don’t have any say in dictating the fit once you put them on foot. 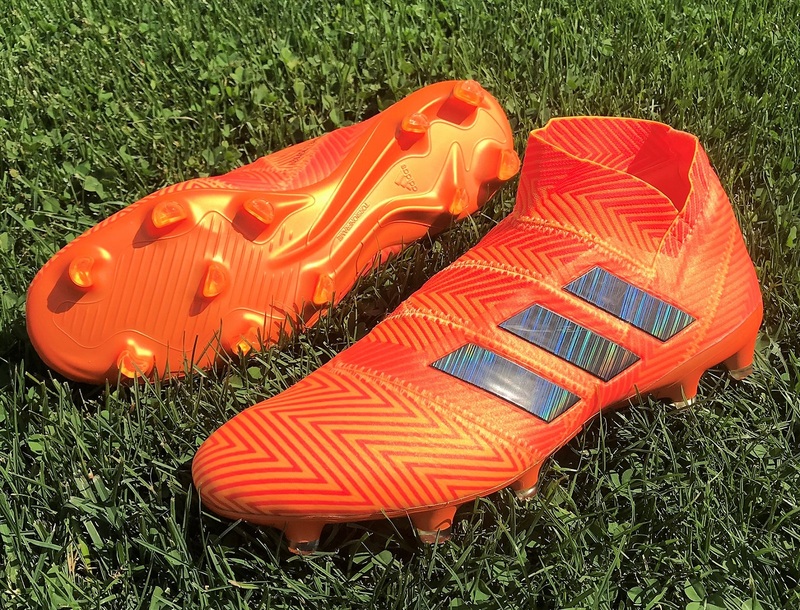 I’ll never understand why taken away a boot feature (laces) results in the price going up! But, if you are gong to take a leap and invest in pair, please make sure they are right for you before. There are several colorways currently available in the Nemeziz 18+ line-up, original retailing at a high-end $290. This pictured Solar Orange colorway is the first on sale, available right now for $239.99. 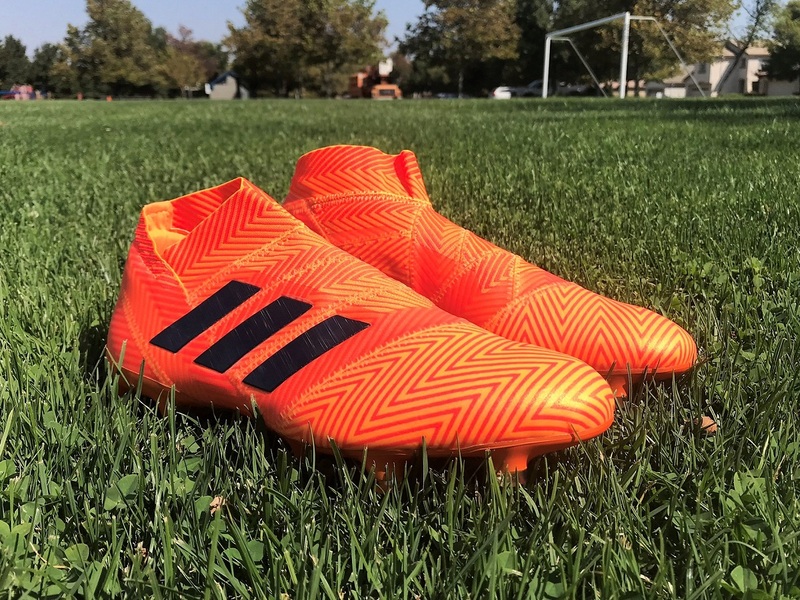 Highlight: If quick, intricate touches and quick passes are part of your game, then the performance of the Nemeziz 18 series is right down your street. Would I Buy Them: I like these a lot, but I much prefer having laces in my boots so I can really define my fit. Player Position: Think of players like Messi’s (even though he has his own version), Salah, Dybala, Jesus, Lucas, even Ander Herrera. If you fit in that bracket, they are a good option. I have a narrow foot, so with that what would be the best laceless boot for me?